Spaghetti Sauce: Homemade & Best Ever! | Simple. Tasty. Good. Spaghetti Sauce: Homemade & Best Ever! We all love a good plateful of homemade spaghetti bolognese, do we! This spaghetti sauce will without a doubt give you a great comfy feeling when you finally come home in the evening after a long day’s work. Who wouldn’t want to relax over a bowl of steaming pasta, a fragrant homemade tomato sauce and loads of grated parmesan cheese! I could eat loads of this stuff: this spaghetti bolognese sauce is one of my favourite comfort foods! Needless to say that this is a classic Italian dish. Bolognese means ‘from the city of Bologna’, an Italian city in North Italy. 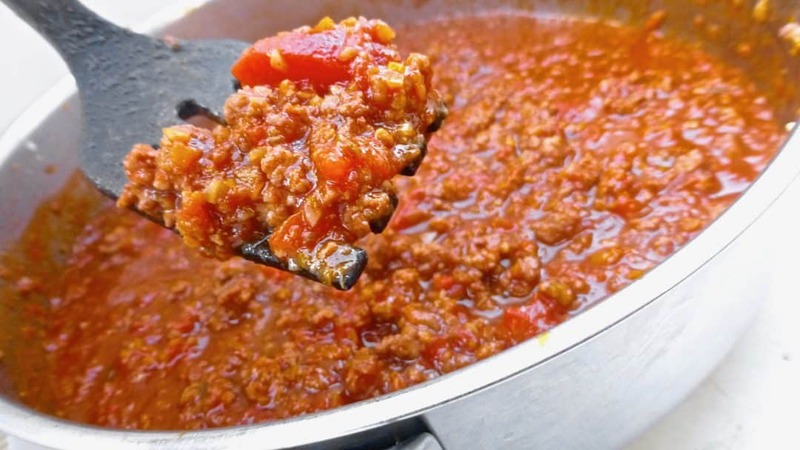 Spaghetti sauce has other names: bolognese sauce, bolognaise in French and Flemish, ragù alla bolognese, ragù bolognese or a plain and simple ragù as in ragout. This spaghetti meat sauce is the king of Italian spaghetti sauce! Interesting to know: tagliatelle pasta is traditionally used to serve with this ragù alla bolognese. Not spaghetti! Watch how I’m preparing a classic spaghetti sauce in my fabulous KitchenAid Cook Processor! For the step by step KitchenAid recipe: scroll down to the second recipe on this page! One tip I want to give you: try to prepare this Italian spaghetti sauce a day in advance and let it rest in the fridge overnight. Believe me: sugo al ragù tastes even better the day after! I love this classic Italian meat sauce. What I do is prepare a large batch of this spaghetti sauce and then freeze it into 2 person portions for us. Whenever I need a quick dinner, I can always serve a good spaghetti bolognese! Even if you have a bunch of friends coming over last minute, no one will say no to a large bowl of steaming spaghetti bolognese. And since I keep a bunch of dry pasta in my pantry at all times, that’s not a problem at all. Every home cook has his or her own personal recipe and interpretation. 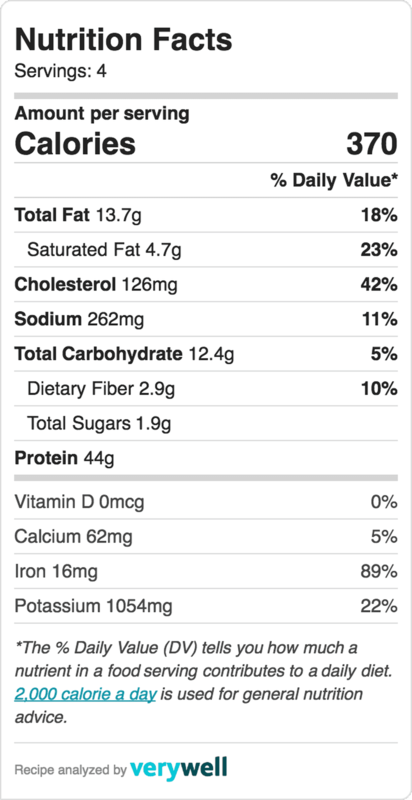 This is my version… But whatever you do: your sauce should contain at least minced beef, garlic and tomatoes. The rest is up to you. Bolognese meat sauce or ragù can also be used as the basis of another very popular Italian dish: lasagna! Also check out my chorizo sausage ragu! Peel the onion, the garlic cloves and the carrots. Chop the vegetables and the celery up roughly. 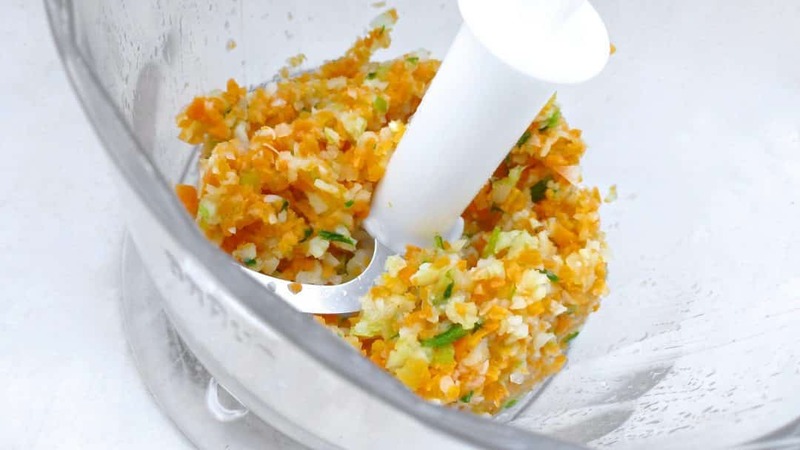 Add it all to a clean blender and pulse a few times until you get a fine vegetable crumble. Pour a good splash of olive oil in large non-stick frying pan and place it over medium heat. 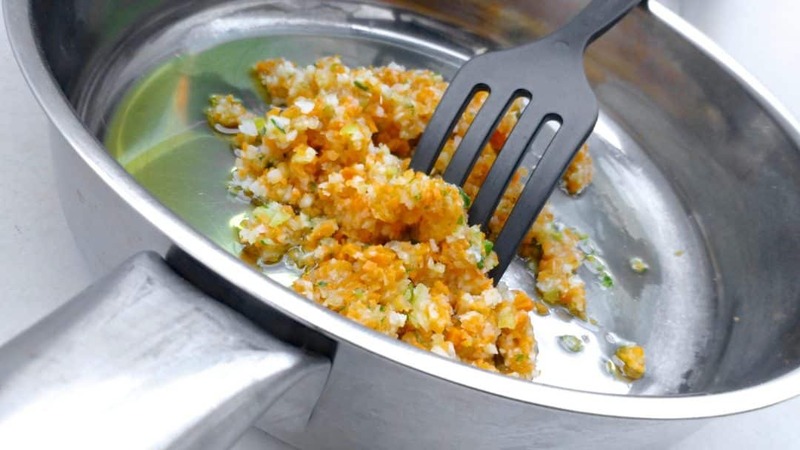 Add the blended crumble of onion, carrot, celery and garlic once the olive oil is hot. Quickly stir fry the vegetable mix for about 4 to 5 minutes until fragrant. In the meantime shred the ground beef into smaller chunks. Then add them to the stir fried vegetables is the hot pan. Stir the ground beef and vegetables regularly and brown the beef for 4 to 5 minutes on all sides. 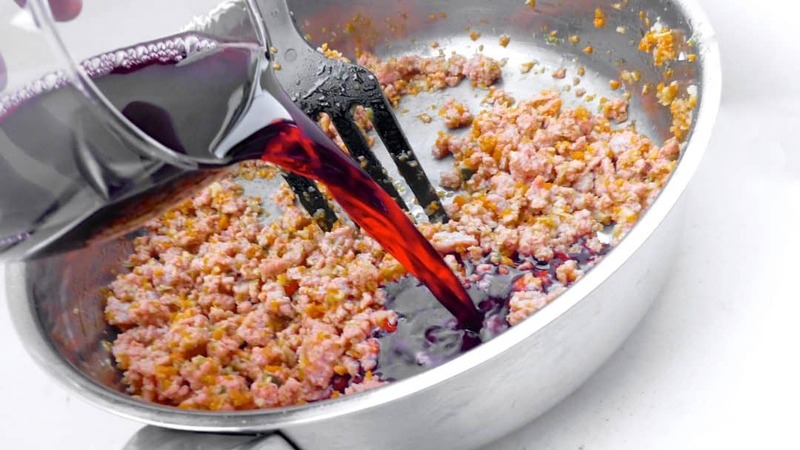 Break any large chunks of ground beef using a fork. 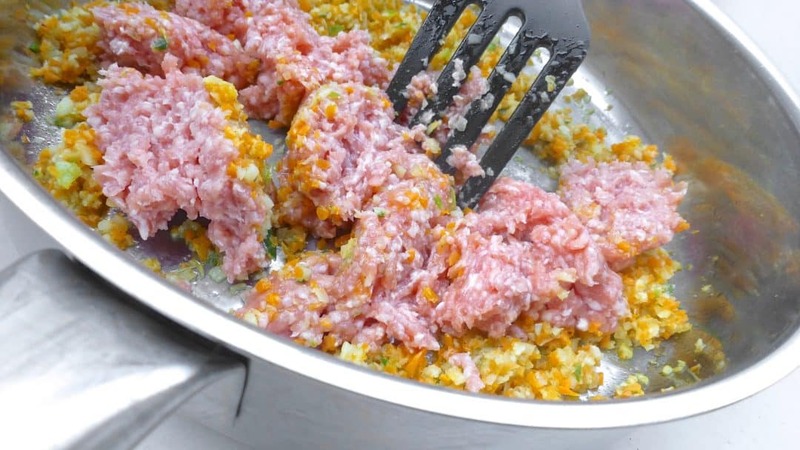 Season the beef mince with a good dash of pepper and salt. I also like to add a splash of worcester sauce (optional) at this stage. Also pour in the glass of red wine. 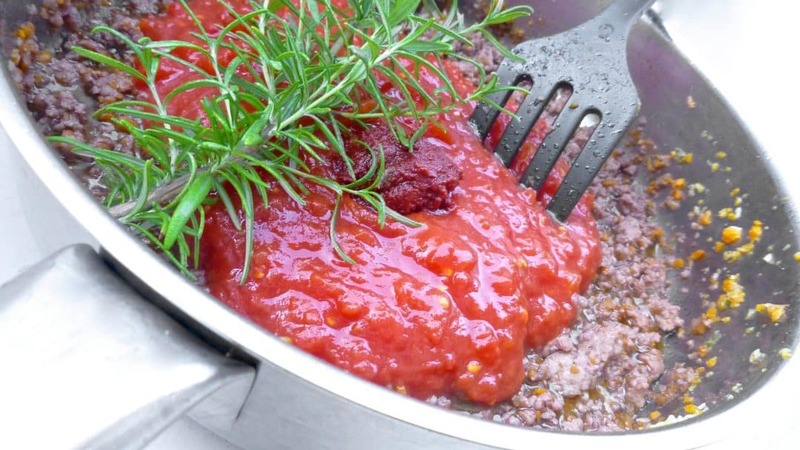 Then add the canned chopped tomatoes, the tomato paste, the balsamic vinegar and the fresh sprigs of rosemary to the baked ground beef. Stir all the ingredients very well now. Then put a lid on the pan and turn the heat a little lower. Simmer the spaghetti sauce for 45 minutes to 1 hour. Keep an eye on the simmering spaghetti sauce and add a little water or red wine if necessary. In the end check the seasoning of the spaghetti sauce and add extra pepper or salt to taste if necessary. Remove the cooked sprigs of rosemary. Take the spaghetti sauce off the heat and let it rest for now under a lid. Cook some pasta in the meantime. Then divide the cooked pasta over deep plates. Top with a good scoop of the freshly made spaghetti sauce. Sprinkle with grated cheese (optional) and serve piping hot. 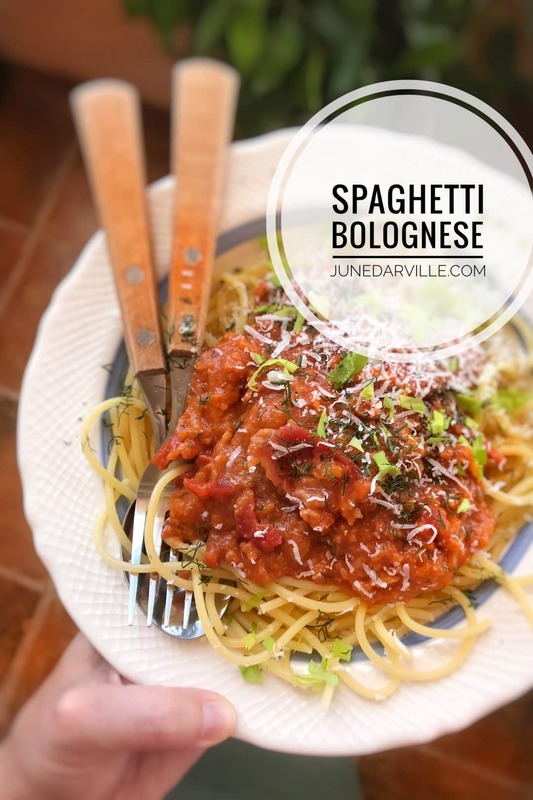 So here’s how to prepare this classic spaghetti sauce in my fabulous KitchenAid Cook Processor! Peel the onion, the garlic cloves and the carrots. Chop the vegetables and the celery up roughly. Add it all to the bowl of the KitchenAid Cook Processor fitted with the MultiBlade. Pulse a few times into a fine vegetable crumble. Scrape down the sides of the bowl, remove the MultiBlade and attach the StirAssist. Then add a good splash of olive oil, the bay leaves and the fresh or dried rosemary leaves. Season with a pinch of pepper. Close the bowl of the Cook Processor and select STEW P5. Press Start to activate the program. After that, add the the beef mince, a splash of worcester sauce (optional), the glass of red wine, the canned chopped tomatoes, the fresh tomatoes and the tomato paste. Season with pepper and salt. Close the bowl of the Cook Processor and press Start to activate Step 2. Keep an eye on the simmering spaghetti sauce and add a little water or red wine if necessary. Once the program is finished, press cancel to exit the keep warm mode. Check the seasoning of the spaghetti sauce and add extra pepper or salt to taste if necessary. Close the lid of the Cook Processor and let the spaghetti sauce rest for now. Bring a large pan of salted water to a rolling boil and add the dry spaghetti to it. Cook the spaghetti until tender and al dente. Then drain the cooked spaghetti. Divide the pasta over two deep plates. Top with a good scoop of the freshly made spaghetti sauce. Sprinkle with grated (parmesan) cheese and serve piping hot. Whenever I prepare a spaghetti sauce at home from scratch, the ingredients that I am using can differ sometimes. It depends on what I can find in my pantry at that very day. Take for instance the tomatoes. Sometimes I add chopped fresh tomatoes and canned tomato puree. But Whole canned tomatoes or chopped canned tomatoes are also a great alternative! Wine? Well sometimes I’ll add red wine, even white wine if I have an open bottle in my fridge. No wine? Then I don’t add any. Taste will not be that different. I once added a littles splash of marsala to my sauce, tasted great as well. Tomato paste? This one gives the spaghetti sauce quite some depth in flavor so I’d definitely add some. Vinegar? I like to add a little balsamic vinegar to my sauce, that’s just a personal touch. Sugar? Yes, well if the sauce is too tard because of the canned tomatoes I sometimes add a pinch of brown sugar to my sauce. An alternative for the sugar is tomato ketchup by the way! 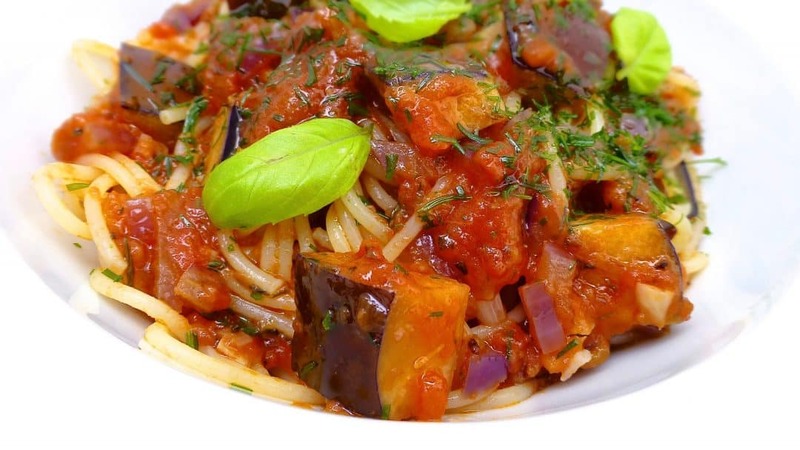 Oh here’s another tomato base spaghetti sauce then: a chunky tomato and eggplant sauce called pasta alla Norma! It’s a great vegetarian pasta sauce and a good alternative for puttanesca spaghetti sauce. Rinse the fresh eggplant and cut off its green leafy head. Slice the eggplant lengthwise and then dice the eggplant slices into smaller bite-size cubes. Pour a splash of olive oil in a non-stick pan and place it over high heat. Once the oil is hot, add the diced eggplant to the pan. Quickly stir fry the eggplant for 4 to 5 minutes until it look kind of golden brown on all sides. Take the hot pan off the heat and let the fried eggplant cool for a few minutes in the pan. Add the chopped dry red chili pepper and the freshly chopped garlic. Put the pan with the baked eggplant cubes back over medium heat and gently bake the eggplant for 2 more minutes. Then add the chopped fresh tomatoes and the red wine vinegar to the pan. Put a lid on the pan and simmer the vegetables for a couple of minutes until the tomatoes start to fall apart and make a chunky tomato sauce. In the meantime bring a large pan of salted water to a rolling boil and add the dry pasta. Cook the pasta until al dente and tender. Immediately strain the cooked pasta when it is tender. Add the chopped fresh basil to the chunky tomato and eggplant sauce in the pan. Check the seasoning of the sauce and add extra pepper, salt or vinegar to taste if necessary. Divide the cooked pasta over deep plates. Scoop the chunky hot eggplant and tomato sauce on top of the cooked pasta. Finish with a good sprinkle of the grated parmesan cheese. Serve the pasta alla norma piping hot.